My last ‘normal’ month for a while, so how did I get on in May? Ooooh, so close at 49.2%! 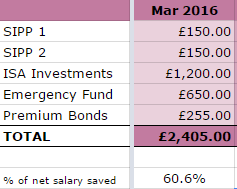 My average savings rate now stands at 51.3%, so still on target. This month’s income was boosted by £50 from rent received, £123 gambling winnings (a small punt on Leicester winning the league, a small win from the Eurovision Song Contest sweep at work and a big win from Man U winning the FA Cup!) and £9.14 from TopCashback*. New capital and steady markets mean that my pot now stands at £68,127.91. 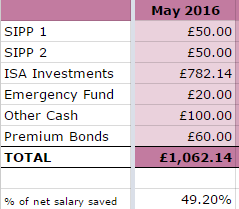 It was always going to be tough to follow last month’s excellent savings rate but how did I do in April? 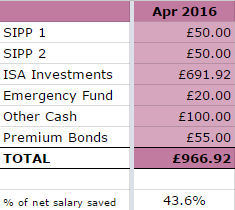 Three birthdays this month meant that my savings rate dropped down to 43.6%! A rather significant fall from last month but in line with my usual and it means my average savings rate now stands at 51.9%, so still on target. This month’s income was boosted by £50 from rent received, £100 gambling winnings (my horse won in the Grand National!) and £41.92 from TopCashback*. Rising markets plus new capital means that this now stands at £66,386.77. March saw me return from my most expensive holiday, but also saw me receiving an annual bonus from work. So, what did that do to my numbers? A savings rate of 60.6%! Actually, it should have been a lot higher than this but I ended up siphoning some towards a fund for future holidays and also, following TFS‘ suggestion, put some towards matched betting (more on this later). My monthly average savings rate is now 54.6% – as I have some ‘high spending’ in my calendar which I hadn’t accounted for when I initially set my goal, I hope I’ve managed to push this rate high enough to keep my average up by the end of the year. Anyway, this month’s savings was topped up with £50 from rent received. From 6th April 2016, it should be possible to invest tax free in peer-to-peer (P2P) lending within ISAs1Individual Savings Accounts. As with other ISAs, you are only able to subscribe to one provider in any tax year – since I have invested in several P2P lenders, I’m likely to convert one of those accounts into an ISA. The impact of peer-to-peer (P2P) lending on the market for investments and financial services in the UK is no longer the well-kept secret it once was, and this was well illustrated by another stellar year in 2015, in which it reportedly swelled to £3.2 billion – up by some 84% on 2014. Certainly, the P2P sector has provided a welcome alternative for investors in a climate dominated by record-low interest rates, derisory returns on savings and Cash ISAs, and a hugely volatile stock market. As a lender through these types of platforms, you are forced to take on a risk to your capital, as funds invested are not covered by the FSCS2Financial Services Compensation Scheme in the event of borrowers (to whom the loans you purchase are allocated) defaulting and/or the platform going bust. However, the UK’s major platforms have countered this with safety measures such as segregated provision funds, and even an insurance against borrower default in the case of Lending Works. 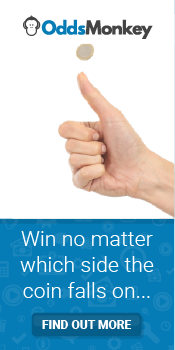 Platforms are also obliged to operate under FCA3Financial Conduct Authority authorisation as of October 2015 too, while eight of the top P2P providers are members of the P2PFA4Peer-to-Peer Finance Association; an industry body that sets out a strict set of operating standards to which all members must adhere to. weenie on Bored Yet, after 5 Years? playingwithfire.uk on Bored Yet, after 5 Years?